Some of the most relevant Tradecorp products have been verified and approved by Ecocert to be used in Organic Agriculture. This way Tradecorp is still in line with its characteristic environmentally-friendly standards, developing and commercialising products that are not only efficient, but also sustainable. Since 2006, we have been working on the approval of our organic products by renowned organisations, guaranteeing the farmer that the product he is using complies with organic agriculture requirements. On an annual basis, Ecocert Ibérica, a Spanish entity that is part of Ecocert, has been carrying out a technical check of our products and a complete audit of our production plants, where it carries out an exhaustive on-site analysis of our production processes. In 2016, 47 products have been approved for Organic Agriculture under European standards (EC Regulations No 834/2007 and 889/2008). 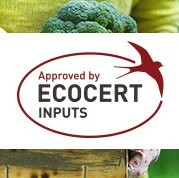 Moreover, 11 of these products also comply with NOP (National Organic Programme).